Saloca in Wonderland: Blog Events - tips and tricks for attendees! 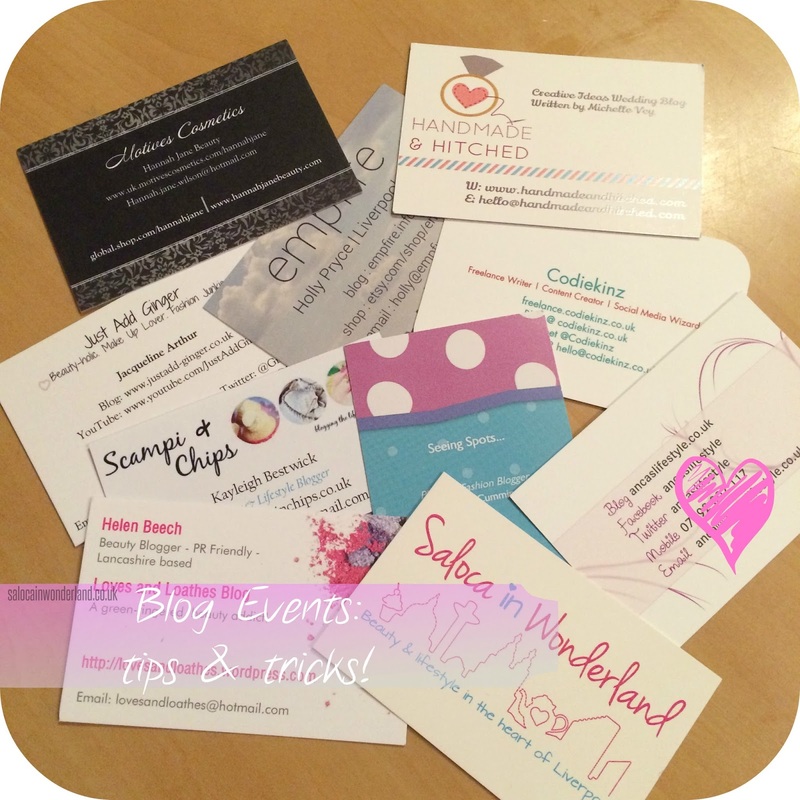 Blog Events - tips and tricks for attendees! From seasoned event goers to first-time blog event attendees, we all have that familiar tingle in the pit of our stomach, that unease as we walk into a room, sometimes alone, not sure if we can match up Twitter handles to real live human faces. Those epic pre-meet conversations you’ve been having online could drop like a lead balloon in real life, and you turn back and look at the door, one last chance to escape. Yes. Blogging events can be that scary. Even if I know half the people who are going and have met them before it still ties my stomach into knots as I head into the venue. I’m not trying to talk you out of going, not at all! I just want you to know that the nerves are normal and from the minute you make eye-contact with your first fellow blogger, those nerves start to calm down. No having to explain what a blog is or why you’re not quite the next Zoella yet. No-body giving you a quizzical look as you snap several pictures of your cheese and ham toastie, angling the plate just right. You can talk about hashtags, SEO, plug-ins and PR and everyone in the room understands. It’s bloody fantastic. If you really want to make an event easier on yourself and to get the most out of it, here’s a few tips I’ve picked up along the way that have really helped me out when attending blogging events! Make them yourself on Publisher, use VistaPrint.com or any other site you come across online, just have at the ready some business cards for your blog. Name, Twitter Handle, Instagram, YouTube, blog link, email address, everything anyone needs to find you online. Not only are these great for handing out to businesses and sponsors at the event, but when the wi-fi is down or you’ve run out of data, it’s a great way to find those lovely bloggers you have just met after the event is over. Kickin’ it old school! From scribbling down notes from speakers to recommending sites and other bloggers to the people you meet, you will find yourself scribbling away all through the event. I’ve even found myself coming up with several blog-post ideas during an event that I really don’t want to forget! I also think using pen and paper to take notes looks a pinch less ignorant than making them on your smartphone, especially during talks. You know you’re making notes, but others might think you’re just on Twitter! 3. Snacks - sharable ones! Unless you’re at a more formal, sit-down dinner event, it could be a while before you get fed - and nobody likes a room full of hangry bloggers! Whipping out a packet of Haribo or Percy Pigs is also a great ice breaker if you’re unsure of how to start a conversation with someone you might have only talked to online. Bring your smile! There is nothing more inviting to another nervous blogger than a smiling face. It goes a long way to making you and everyone else around you more comfortable. I swear, bloggers are some of the friendliest, chattiest people I’ve ever met and once you’ve met someone once, you have a familiar face to look out for at other events. We’re all happy to take you under our blogging wings and bring you into the fold! We’re all guilty of stalking our favourite bloggers online. So feel free to do the same (not the creepy stalking!) with those attending your blog event. Chances are there will be a hashtag in use prior to the event for everyone to find each other and say a little hello online. After that hello, go and have a look at their blogs. Have a look at their most recent posts. If you find something you like, voila, you have an instant conversation starter when you meet them at the event. Look through their Instagram, have they been on holiday recently? To another event? These are all great ice-breakers, and let’s be honest here blogging buddies, we spend how much time talking about ourselves and our lives online? We’re going to love to carry that conversation on in real life too! Ding ding, bonus round! Bring your blogging story. It doesn’t have to be long, but a brief intro to yourself, your blog and why you blog. If you can throw a little humour in there or a funny story of how you Nan found your blog then go for it. Lots of events when ask this at the start as a little ice-breaking exercise to get everyone in the room involved. Shout out to the lovely bloggers featuring in the header image! Loves and Loathes, Ancas Lifestyle, Codiekinz, Seeing Spots, Scampi & Chips, Just Add Ginger, Empfire, Handmade & Hitched, and Hannah Jane Beauty! How do you feel before a blogging event? Let me know in the comments below! Discount codes are the best! I wouldn't order more cards without one! I haven't been to a blogger event yet but I hope to soon and this is really helpful! I've been putting off trying to attend one because I've been a bit too shy and afraid but this post has made me feel a lot better about attending one! We've all been there, I was absolutely terrified the first time I went to an event but it was brilliant! Just remember that every other blogger there has felt exactly how you're feeling, we're all in this boat together! I have cards but I'm always too nervous to give them out, haha! I think we all feel the same about this, everyone is just waiting for that first blogger to whip out the business cards then everyone else will follow suit! Great tips! I haven't been to a blogging event yet but now I've learnt some things for when I do attend my first one! Was such a nice surprise to see my card in the header after I had bookmarked your blog to read! Couldn't agree more with these tips! I just wish I had read them before going to the first one - I was terrified. The first one is always the scariest but they do get a little easier, especially when familiar faces start to pop up and all the events! Your welcome! :) I do try and read up on attendees blogs before hand, gives you a good idea of things you might have in common with other bloggers who are at the event!